Jennifer Crane looks over the patch of Santa Rosa ground farmed by Crane ancestors for the last 155 years and makes the sad assessment that this year’s crop of Crane melons is late and in short supply. “ The season for Crane melons will be short and sweet this year. There wasn’t enough spring rain to provide the moisture the vines needed to produce a bountiful crop,” said Crane, 28, the sixth generation of her family to farm the Santa Rosa land settled by Crane family members in 1852. The land has produced everything from oats to sheep, with Crane melons being a farming mainstay since they were developed in the 1920’s by Jennifer’s great, great grandfather Oliver Crane, a homespun plant breeder. Crane expects her first Crane melons to be harvested in the second week of September, with the season lasting until the last precious melon is picked or the first frost hits. When the season’s first melons roll out of the fields, the Cranes will open their landmark Crane Melon Barn on Petaluma Hill Road where customers flock to get the original Crane melons. Each fall the historic barn, built in 1868, becomes a bustling trading post for Crane melons, a uniquely Sonoma County fruit enjoyed by local residents for more than 80 years. The delectable, soccer-ball-sized Crane melon was developed when Oliver Crane crossed a Japanese melon and a California cantaloupe, creating a new melon that is more flavorful than either parent. Each year, Oliver Crane selected the biggest and best melons for next year’s seeds, genetically selecting for melons that flourished in the family’s adobe soil along Petaluma Hill and Crane Canyon roads. Other growers produce Crane Melons too, but the Cranes consider these melons inferior imposters. The Crane melon was developed by my great, great grandfather, Oliver Crane, to be grown on his property in the adobe soil and dry farmed. This ranch has the climate and soil conditions where the Crane melon, through genetic selection, attains its untimate flavor and texture," said Jennifer Crane, who started working in the Crane Melon Barn when she was four years old. A wine grape grower too, Crane said what makes their Crane melons so much better is the terroir, a French term for the special combination of soil, climate and farming techniques that allow a food crop, whether wine grapes or Crane melons, to acheive their ultimate flavors. 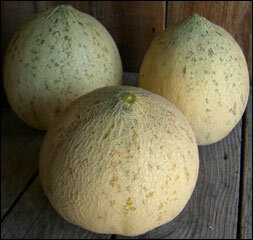 Crane melon had become the generic name of the melon developed by the Crane family. The legal ruling cleared the way for melons not grown by Crane family members to be called a Crane melon. So, increasingly farm stands and grocery stores are selling Crane melons raised by other growers. Jennifer Crane compares a true Crane melon, grown by Cranes on Crane land, to an authentic Louis Vuitton handbag, which faces competition from cheap knock-offs. “It’s a matter of quality and getting the real thing,” said Crane. Melon season is a busy time for the Cranes but they have friends and family who pitch and help. Jennifer Crane, who went to college in London, has a circle of close friends who live around the world but come to help during the melon season. It’s a pleasant break from their fast-paced urbane lives in big cities. “ My friends love coming to Sonoma County and being part of our farming experience each fall,” said Jennifer Crane. Crane’s father, Richard Crane, who learned the secrets of Crane melon growing from his father, the late George Crane, said he’s seen much bigger-yielding melon crops in the family’s fields. This year is a disappointment because it takes as much work to grow a small crop as a big one. “ We needed that extra eight to nine inches of rain that we didn’t get this year,” said Richard Crane, whose mechanical and artistic talents are evident on the grounds of the Crane Melon Barn. He specializes in a unique form of garden sculptures fashioned from scrap farm machinery and implements. Like their ancestors before them, Jennifer and Rick Crane produce melons that are dry-farmed, which means the vines aren’t irrigated during the growing season. The plants are watered just enough to get them started in the spring but then the Cranes depend on the heavy adobe soil to hold the moisture necessary to get the vines through harvest. It’s a farming method that works most years. But this year’s low rainfall didn’t provide the moisture to sustain a big crop. The Cranes take the smaller crop in stride, knowing full well the vagaries of farming and the impact that Mother Nature has on the size and quality of crops. Like all farmers, they hope next year will be better. The Cranes plant 35 acres of their 142 acre ranch to Crane melons, producing hay on the remaining farmland. The Cranes also have planted five acres of pinot noir wine grapes on the family land, selling grapes from what they call Chester’s Vineyard to winemaker David Noyes, formerly of Kunde Estate Winery. The vineyard is named for Jennifer’s cat. Jennifer Crane, the only child of Richard and Cindy Crane, plans to be farming all of her life on the family land that has spanned three centuries under Crane ownership. She is passionate about carrying on the family’s ranching tradition on the adobe fields outside Santa Rosa.